Compare prices on car hire in Alicante from all the major brands and find the best deals. When you book through us, unlimited mileage and insurance are always included in the price given. Alicante is the capital of the province of Alicante and is situated on the Mediterranean coast, and from the port exported raisins, wine, fruit and olive oil. Alicante is the second largest city in the region of Valencia with a population of approx. 315000 (2009) in the city and more than 450 000 in the metropolitan region. This is Spain’s eighth largest metropolitan area and the city is one of the fastest growing in the country. 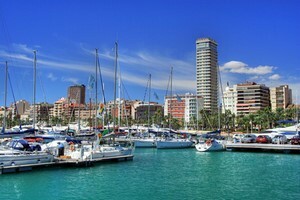 Many connects Alicante with long beaches, palm trees and green sea and the town is a popular tourist attraction. In addition, Alicante’s historic city that was founded by the Phoenicians in 325 BC. In the old town one can see many historical buildings and sights, including the medieval castle of Santa Barbara is one of the largest in the country. Alicante is a very rich city limits with numerous parks such as Mount Benacantil with eucalyptus trees. Carnival in February and the Easter festival is just one of many festivities held every year. Alicante Airport is located nearly 10 km outside the city. Alicante and Alicante Airport is the most popular destinations for booking of car hire in Spain .It is extremely competitive so prices are very low. Car-hire.net do their utmost to push prices down and to order early, you can get cars at well below $ 100 per day if you order more than 5 days. Car-hire.net offers car hire at several locations in the Alicante area, even at Alicante Airport. Some of our rental cars include: Peugot 107 and 207, Ford Fiesta, Volkswagen Golf, Ford Estate, Citroen Picasso, the Volkswagen Touran – 7 seats, Alfa 159, and Audi A4.